Have you ever thought about the fact that our minds are positively brimming with all sorts of random information? Things to eat, pop songs, websites, etc. Normally it's easy to give an example of a frozen food or a dog breed, but can you do it before your opponent has a chance to blurt out their answer? Who knows! Pay attention, it could be your turn at any time! 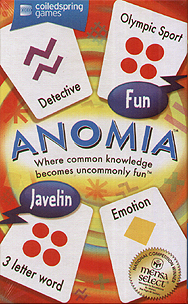 ANOMIA will have everyone laughing out loud while they try to beat each other to the punch. Beware! While you may think giving an example of a type of shoe or an ice cream flavour might be easy, you will find that your brain works a little differently under pressure.